When I was studying at University, the IEEE working group posted 802.1aq draft but the SPB standard is already a reality ready for deployments since the IEEE approved the standard on March 2012. I was wondering if SPB is taught at Universities today or teachers keep teaching the traditional Spanning Tree Protocol (STP) without mentioning the pros and cons of using STP against SPB. This new technology was used inside the network of the Sochi Olympics by Avaya, which was capable of handling up 54 Tbps of traffic, and since then, we can see more and more deployments of SPB. 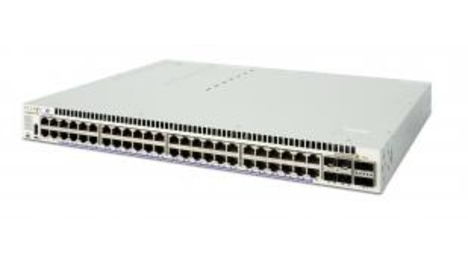 Therefore, I'm lucky today for having two Alcatel-Lucent OmniSwitch 6860E with advanced routing license to test Shortest Path First and sharing with you the SPB configuration. 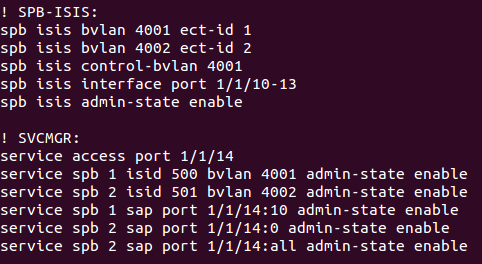 The first one is the Backbone configuration where we have to create the Backbone VLAN or BVLAN, which is the base of the SPB-M infrastructure and it will be associated with an equal cost tree (ECT) algorithm ID and a SPB service instance ID (I-SID). We also have to configure the SPB interfaces which will be associated with each BVLAN and they will send and receive ISIS Hello packets and link state PDU (LSP). In addition to enabling/disabling ISIS-SPB instances, we can configure ISIS-SPB global parameters like wait time intervals for customizing the Backbone SPB. The second and last step is the Service configuration where we are going to configure SPB-M services associating a Service Manager ID with a BVLAN, I-SID and Service Access Point (SAP) to identify the customer traffic that will be encapsulated by the service. We also have to configure access ports where customers are going to be connected and it will be associated with a SAP. Optionally, we can configure a layer 2 profile to access port for 802.1X authentication or 802.3ad link aggregation. In addition, we'll have to configure Service Access Points (SAP) to bind a SPB service to an access port for defining which customer traffic will be encapsulated through the service. Once we have configured SPB, interconnected switches through Backbone interfaces and connected customers to access ports, we should verify the Backbone configuration and the Service configuration to know if everything is working as expected. For instance, we can see BVLANs with their ECT-algorithm ID of a Backbone testing configuration, and we can also see Service ID with their Administrative and Operational status of a Services testing configuration in the next images. If we are a little bit freak, or rather, professional network engineers, OmniSwitch has the tcpdump tool which allow us to analyse network traffic for troubleshooting propose. As a result, it's easy to get SPB frames to see customer frames encapsulated inside SPB frames where the standard 802.1ah, called Provider Backbone Bridging, makes a layer 2 tunnel through a layer 3 network to connect different customer sites or datacenters. Regards my friends, configure Shortest Path Bridging in your network, it will be mandatory, now, or in the near future.